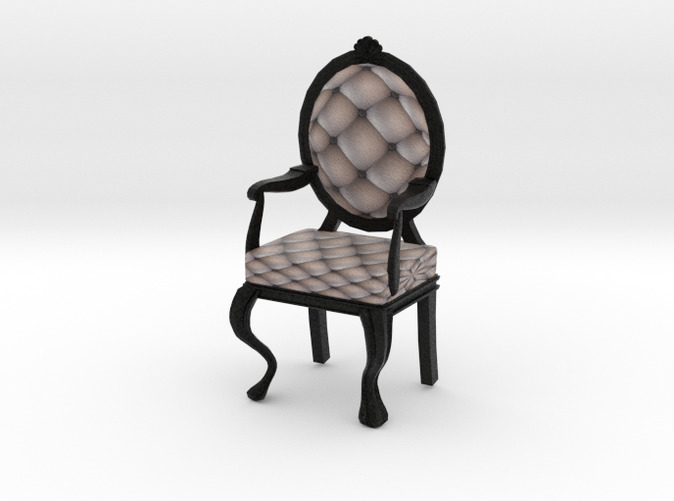 This faux silver quilted, black framed Louis XVI Oval Back Chair is the perfect, elegant addition to any 1/24 half inch scale miniature setting, whether as an armchair in a dollhouse living room, at a vanity in a miniature bedroom, or place several of them around your choice of traditional or French Country dining table. Available in multiple faux wood frames and colors/styles of faux upholstery (see our other listings for this style of chair in other style combinations as well as miniature dollhouse scales). NOTE: This item is made out of sandstone, which is breakable. Please allow only older, responsible doll owners to handle this item to reduce the chances of breakage. This miniature should also be kept away from all liquids, as its getting wet will result in drastic fading of its colors. Sturdy, waterproof, solid colored plastic versions of this miniature are available in our other listings for younger doll owners.